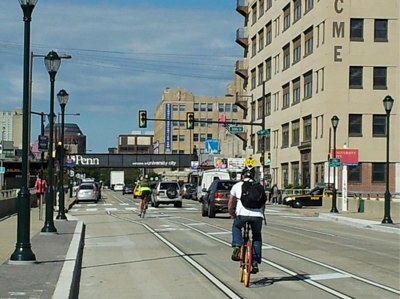 In a decision that local advocates say delivers a “strong message” to drivers, a Philadelphia jury awarded a cyclist $2.4 million in damages earlier this month for injuries she sustained in a 2011 collision. Ashley McKean was seriously injured when a driver doored her and she was then struck from behind by a van driver who was following too closely. The driver who doored McKean was found to be 43 percent at fault for the collision, the driver of the van 36 percent and McKean herself 21 percent, Philly Magazine reports. After the collision, the driver of the van reportedly told her she should have been riding on the sidewalk — which is illegal. According to her attorney, Chris Brill, the formerly “athletic” McKean was lucky to survive but can no longer run or walk long distances. Brill said he’s not aware of such a large settlement ever being awarded in the U.S. for a dooring injury. Sarah Clark Stewart of the Bicycle Coalition of Greater Philadelphia agreed that the award is significant. “I think that it does send a very strong message that bicyclists need to be taken seriously, and their safety needs to be taken seriously,” she said. I’m a big believer in making sure the city pictured is actually the city discussed in the article. However, Philadelphia and Toronto do have a lot in common; love/dislike of Joe Carter aside. Congratulations to Chris Brill on a great result for her client. No amount of money can restore Ashley McKean to her life before the crash, but at least the system worked the way it is supposed to in this case. Wonder what she was 21% at fault for? Unsure (obviously). But cycling groups are pretty vocal about trying to stay out of the “door zone”. As always, easier said than done. But if I were to guess, probably related to that. I LOVE to know how they got to numbers so “accurate”. That is totally Toronto. Corner of Dundas and Spadina, with the CN Tower in the background. Other than that, a good piece. What I don’t understand about settlements like these are, where does that money come from? Did a millionaire door her? If not, how does she get paid? The insurance companies of both drivers will pay up to their policy limits. She could also pursue their assets (houses, cars, bank accounts) and/or request garnishment of their future earnings. It’s unlikely that she’ll get the full amount, but does give her several avenues to get at least some of the judgement fulfilled over time. We have no photo budget. Take more pictures of people biking in your cities and put them in the public domain if it bothers you. More filming leaving the USA and going to Canada!?! Why Streetsblog, why? First I am thankful the individual is alive. I enjoy a good bike ride and feel terrible for what happened. Separate thought here however: This is ridiculous and quite frankly, beyond belief. The bicyclist was found to be partially at fault but received more than $2M! What? How much $ did the person who did the dooring receive? How much $ did the person following too closely receive? This makes me never want to drive in a large city. If bicyclists who zip through just inches away from cars can get multiple millions if dollars in crashes they are partially responsible for, that is an absolutely terrifying thought as a driver. Ridiculous! All I’m trying to say is, if there were a bunch of pictures of female cyclists riding through Philadelphia in the public domain, I wouldn’t have used one from Toronto. You’d be surprised how few photos of cyclists, and buses and parking there are available for free use at all, much less in every city. Yeah! My favorite Philly bike shop used to be just past the U Penn sign! No photo would have been better than one that was obviously NOT Philly. Really?!?! Are you that crass? She is the one with the permanent disabilities and can’t even ride anymore but since she was found to be mere 21% at fault, she deserves nothing? Her fault was likely for not riding out of the door zone which is something I’ve see way to many even experienced cyclists do. Why does the person with the dooring need money? Was the door damaged? Grow a brain. I would also be interested to know why the cyclist was found 21% at fault. Andy, I rest my case. ‘Her fault was likely for not riding out of the door zone’ as you say is exactly why I made my comment. If the bicyclist was at fault for riding in an area where she should not have been riding, how does anyone justify this massive payout? The crash would never have happened if, as you say, she had been out if the door zone. Take your emotions out if it, I specifically wrote in the beginning of my post that I feel terrible for what happened. It’s awful. But what’s worse is two million dollars being given to someone who has legally been declared to have played a role in the incident happening! grow a brain, I was making a point. This settlement was absurd considering the bicyclist was declared by the authorities to have been partially at fault. Of course I don’t think the other parties involved should have received money. Take a breath. Ummmm…. Riding in the door zone is NOT a moving violation but opening a door into traffic and following too closely behind a vehicle that you can’t avoid crashing into it when it stops suddenly both are. There is really no emotion involved in my reasoning and obviously a court of law that had much more of the facts in front of them thought that, while she could have done more to protect herself, she was more a victim of the actions of the others than her own. Point taken. I’m against excessive awards being given via lawsuits. This falls into that category, for the simple fact that the recipient was found to be partially responsible. If she was found to be not at all responsible, give her a check with as many zeroes at the end of the number as Donald Trump’s bank account. But not if she bears some of the responsibility. Sorry, you won’t convince me this amount is justified. Agree to disagree on the financials. What’s important is that she’s alive. I am very thankful for that. Hopefully drivers and bicyclists will all be more careful. RTFA – If she’s under 50% responsible, she collects. In this case she was badly damaged — and that is not too surprising, cars and vans are capable of doing a lot of damage, and if that possibility makes you less enthusiastic about driving, that’s okay. I see how people driver, clearly this possibility is not considered often enough. That said, there’s no explanation for the “21%” figure — I’d like to know what traffic law she broke, or what due care she failed to exercise. Being tailgated by a van is kinda intimidating, and might have caused her to ride further into the door zone than is prudent. And “hopefully drivers and bicyclists will all be more careful” — check the stats on harm done to others, like pedestrians. Bicyclists already ARE more careful, far more careful. They’re about 15x less likely to kill a pedestrian, and similarly less likely to maim someone else in a horrible accident like this. Car drivers bring the danger, the harm is overwhelmingly a result of their actions, not anyone else. This is not equal blame or equal responsibility or both-sides-do-it. Your own comment said a court of law had the facts in front of them and now you’re disputing that court’s assessment of what happened in your argument. Sorry guy, you just blew your own case out of the water. Buh bye! I didn’t dispute it, I said I was curious. How can we learn from these things if they are not explained? How does someone obey the law (not get cited, at least) yet still end up 21% responsible? I’d normally imagine a bike rider would be a little curious about that. If this is really about the door zone, this indicates that we should be even more aggressive about staying out of it, lest we be found partly at fault for our own injuries. If it’s not about the door zone, what other things is it that we should not be doing? But the legal document does not say. I see now this was someone else replying. Well I will still defer to the argument above that the court of law had the facts. As such I still don’t understand how they can give such a massive award to someone they found partially responsible and to your point, yes that absolutely scares me as a driver. No one is perfect behind the wheel and if a bicyclist is partially at fault for causing a crash with a driver and then gets millions that is most definitely cause for concern for all drivers. I want everyone to be safe and for no injuries to happen. Period. I just hate the idea of grand sums of money being awarded like this when the person receiving it was legally found to have partial fault. That’s all. The court should just declare it zero percent fault if they are going to make an award like this. It would look so much better.